Today the weather forecasts were completely wrong. Instead of rain, we had sun; instead of 70's we had 60's. Acadia is on an island called Mt Desert Island. There are free propane buses sponsored by L.L. Bean that take you all over the island. We took advantage and went to Sand Beach. 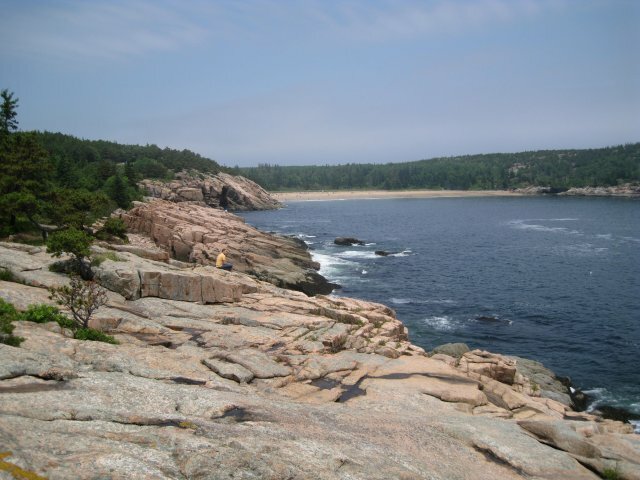 We then hiked high along the coast on granite cliffs beside scraggly pitch pines to the Thunder Hole. The number one cause of accidents is falls on the rocks here. It's not hard to see why in this photo. The cliffs drop off 300 ft or so. Thunder Hole is a narrow channel in the rocks where the swells come into a chamber and compress the air with a bang like thunder. Another bus picked us up at Thunder Hole and took us back to the campground. The new hiking boots worked beautifully.